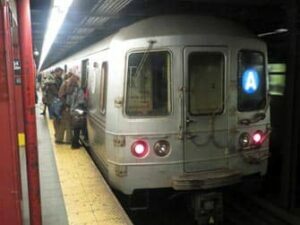 The New York subway (Metro) is the most customary means of transport amongst New Yorkers. The subway is an easy and safe way to get anywhere in New York City. 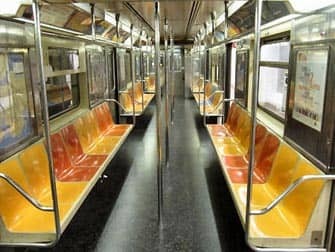 The New York Subway runs 24 hours a day, 7 days per week, 365 days a year. 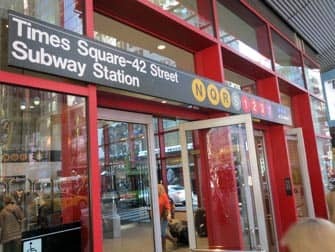 With a MetroCard a single ride costs $2.75 and is therefore one of the cheapest ways to explore the city. New Yorkers call the subway lines “trains”. 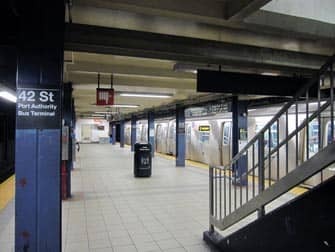 The New York subway has 468 stations and 24 different lines. They are identified by letters A, B, C etc. and by numbers 1, 2, 3 etc. These lines serve the Bronx, Manhattan, Brooklyn, and Queens. The trains run every 2 to 5 minutes during peak hours, every 10 to 15 minutes during the day, and about every 20 minutes at night. The busiest times are usually on weekdays between 07:30 – 09:30 and 16:30 – 18:30. However, late at night I would recommend a taxi especially if you are travelling alone to / from the outer boroughs. Using the New York Subway is easy. Firstly, you’ll need a subway map to give you an overview of all of the trains and stations. You can download my free Eric’s New York app for an offline map on your phone or download one here as a PDF. Free maps are also available at many of the stations. 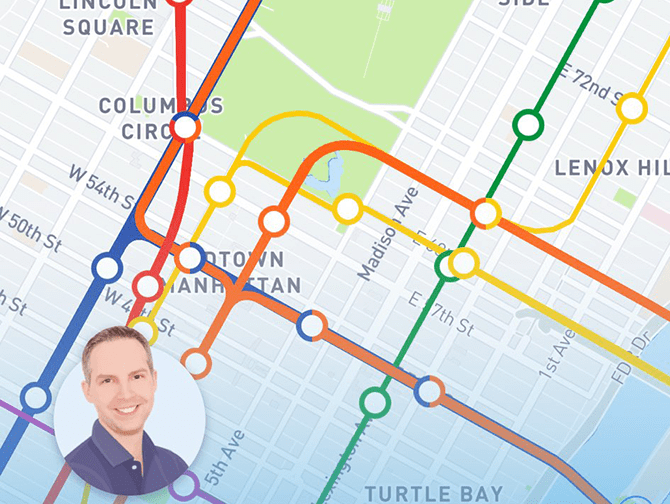 On the map you can find your destination and the closest subway stop. If the stop has a black dot it’s a local train, if it has a white dot its an express train. Local trains stop at all stops, express trains stop at a few stops. If you need to travel to New Jersey, check PATH Train. Once you’ve figured out which line you need to take, you can head to the nearest subway station. 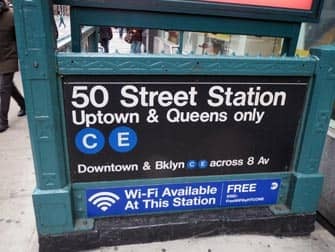 All stations are clearly marked with the entrance to the track heading north (Uptown and Queens) or south (Downtown and Brooklyn). Note: The schedules can change a lot during weekends due to planned construction works. Always read the notices carefully that hang at stations. They will guide you to an alternative route. To make travelling even easier, a number of stations now have interactive maps: large touch-screens that can help with navigating. You can also see if there are any delays or power outages that may affect your journey. If you buy one ride, it will cost $3.00. If you buy a Pay-Per-Ride MetroCard (MetroCard with a balance), you only pay $2.75 per ride. Note that the destination doesn’t matter: it’s $2.75 however far you travel. There is also an Unlimited Ride MetroCard available for 7 days that costs $33 plus $1 for the card itself. This is handy if you plan on using the subway frequently. Children who do not exceed 112 cm in height can travel on the subway for free, regardless of their age. Senior tourists pay the same rate as adults. You can buy or add credit to your MetroCard at any station either by using a machine or at a ticket booth. You can pay by cash or credit card. When paying at a machine you will be asked to fill in your ZIP code, simply fill in “10001”. For every new MetroCard you will be charged a $1 fee, after that you can recharge it as often as possible without additional costs. 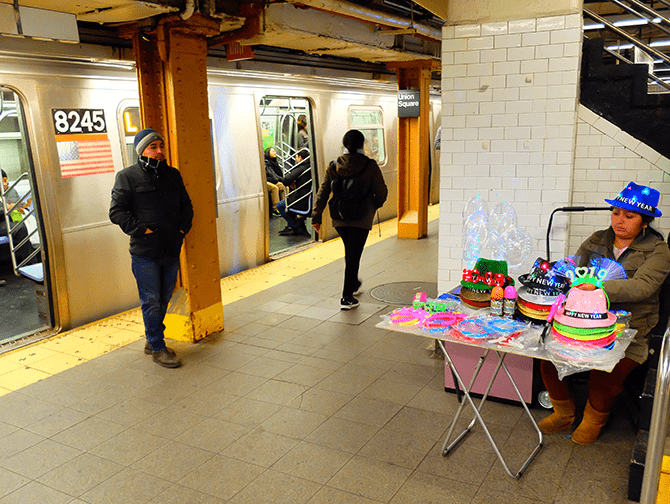 You can use your Pay-Per-Ride MetroCard (NOT the unlimited) for several people (up to 4), which is something different from most other cities’ subways. All you need to do it swipe the card, then hand the card back to the next person. This is legal! It gives you a lot more freedom as well. Eric’s Tip: I used to advise people to get the Unlimited Ride MetroCard for $33 + $1 for the card itself, which is easy and great if you plan on using the subway a lot. Now I encourage more people to take a Pay-Per-Ride MetroCard. And here’s why: If you’re in New York for 4/5 days you’d have to take the subway at least 3 times a day to get your money’s worth. Some days this will be fine, but other days you’ll just want to stroll around or take a taxi.